Weber State coach Jay Hill believes in his former punter, Blake O'Neill. You have to move on. That’s the message Weber State coach Jay Hill delivered to his former punter Sunday, the day after Blake O’Neill became a household name. On Saturday, the 22-year-old Australian reached Bill Buckner-level infamy when he committed an error that squandered Michigan’s two-point, fourth-quarter lead over arch-nemesis Michigan State. As practically everyone has seen, up 23-21 with 10 seconds left in the game, Michigan only had to punt the ball to the Spartans and hold tight until the time expired. Solid plan, except O’Neill fumbled the snap. The ensuing bobble was caught by Jalen Watts-Jackson and brought back 38 yards for the game-winning touchdown as the clock struck zero. It was one of the most improbable finishes in college football history and handed No. 7 Michigan State a 27-23 victory over No. 12 Michigan. The play has been called everything from the "Gift-Six" to the "Bungle at the Big House," but O’Neill probably calls it the worst day of his life. Hill, who recruited O’Neill to Weber State after he saw video of him punting in Australia, called him and urged him to put the play in his rearview mirror. "I told him, ‘Blake, you made a mistake, bud, and it hurts, I know it hurts. But you have to move on because you’re going to have to go out and punt very good next week," Hill said. "(Michigan) has a bye this week, but he’s going to rebound and have a heck of a game next week. "You can’t dwell on that stuff. You have to move on. That’s sports. That’s every week in college sports. Things like that happen and you have to move on." "You can’t dwell on that stuff. You have to move on. That’s sports." Needless to say, O’Neill’s gaffe did not sit well with Wolverines fans, who harassed him on social media. The abuse got so out of hand that Michigan’s interim athletic director Jim Hackett wrote an open letter urging cooler heads to prevail. "Today I awake to the shocking reality that our community who care so much about this program would send hurtful, spiteful and vicious comments to one of our students," the letter read. "… I’m asking that our community not lose this game twice by condoning thoughtless comments." Hill said his former punter felt terrible about the blunder, but he has faith that O’Neill will rebound. "I talked to Blake and he’s doing OK. He’s taking it hard, but at the same time he’ll bounce back," Hill told FOX Sports on Monday. "He understands the whole grand scheme of this. He still has a bunch of season left, and (Michigan) is going to be super successful. He’s just got to get his mind right to finish the season the right way, and I think he’s in the right mindset." It was that mind that impressed Hill the first time the two spoke. "He was sharp. I could tell that on the phone," Hill said. "He was very educated. He was sharp. He handled his business the right way. I mean, he got into graduate school on his own; I didn’t do a thing. He did it all on his own. He had everything taken care of. 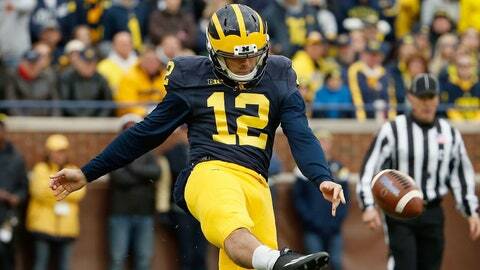 "… I thought he was one of the top punters in the country the way he played his last seven games last year." "… What stands out to me is just what an awesome kid he is. He’s very educated, he’s very smart and he’s very driven. … He’s what you want all your football players to be." The former Australian Rules football player enrolled in Weber State’s Master of Professional Communication program in 2014 and finished sixth nationally in the FCS with a 44.1 yards per punt average to make the Big Sky Academic All-Conference team. "In my opinion, I thought he was the best player in the Big Sky and I thought he was one of the top punters in the country the way he played his last seven games last year," Hill said. "He was that caliber of a guy." It was O’Neill’s passion to further his education that put him on a path to Ann Arbor — that and an assist from Hill. "He came to me after the season and said, ‘Coach, listen I’m not coming back to Weber.’ The more he got into the degree here the further he was getting away from what he wanted to do," Hill said. Knowing he wasn’t coming back to the Wildcats, Hill placed a call to newly hired Michigan special teams coach John Baxter on O’Neill’s behalf. "I called Baxter and I said, ‘Here’s the deal. I don’t know what your situation is in Michigan and if you need a punter at Michigan or not, but I got a guy that I think is really good. He’s one-for-one (one year of eligibility), if you need a guy he was one of the top guys in the country for the last seven games or so.’"
O’Neill is averaging 41.1 yards per punt with the Wolverines, and Hill said his faith in his former special teams ace has not wavered one bit since Saturday. In fact, he said the adversity will only make him stronger. "My guess is this situation will only make him tougher, more resilient and he’s going to bounce back and have one heck of a second half of the season," Hill said.